A spill kit specifically for the clean-up of formaldehyde. 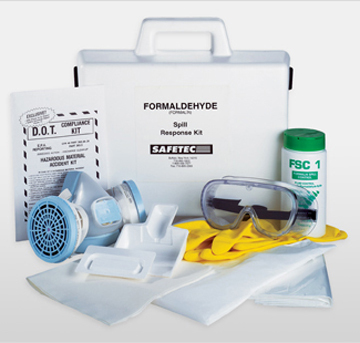 This Formaldehyde Spill Kit features FSC-1™ to aid in reducing exposure to formaldehyde gas in the event of a spill. The formalin is transformed into an easily removable semi-solid mass. The resulting mass cools rapidly minimizing formaldehyde off-gassing. Freight quotes are estimates only and do not include fuel surcharges that change daily. Actual ratesmay vary.